Oh!! if you missed our Black Friday sale, my creative council have convinced me to offer another coupon for Cyber Monday! The code will be good for 30% off everything IN STOCK in the store!! Code is good starting at midnight Nov 29th, ending at midnight Nov. 30! feel free to share the code! The store carries Flower Soft and Shimmerz too! Tell Pamela Shelly sent you! Thanks for playing in my Blog Candy Giveaway. 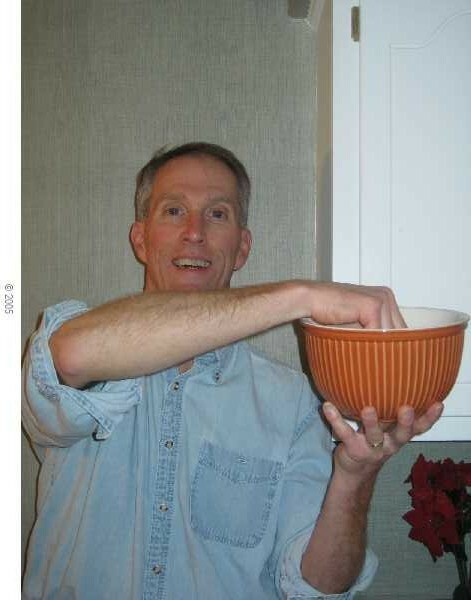 My husband picked the winner for me and was nice enough to let me take his picture! This is my Husband Ray- he is thrilled to help me pick a Blog Candy winner! Ray pulls out the winning name- Karli! Karli, you have 48 hours to send me your address. Congrats! Thanks to everyone that played! 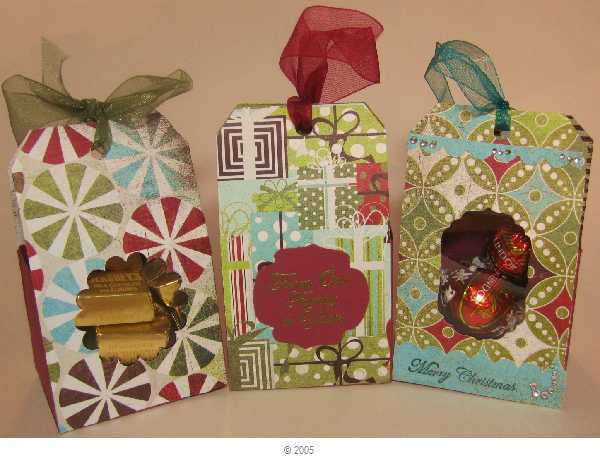 Blog Candy closes tonight at 8PM- I am giving away 6 Cuttlebug Folders found at HSN. Post a comment on THIS POST for a chance to win! My card for today is called Medallion Window- that is a Technique Junkies method I learned recently. It was made for a 1-4-1 swap...and I am a little late sending mine- they are due today. This is a close up of the center of the medallion- it is raised up on dimensionals. The Metallic Silver background makes this look as if it is off white- I cannot get another photo this AM. I paper pieced the silver at the top. The colors of SU markers I used are Red, Brilliant Blue, Bordering Blue, Yo Yo Yellow, Barely Banana and Glorious Gree. 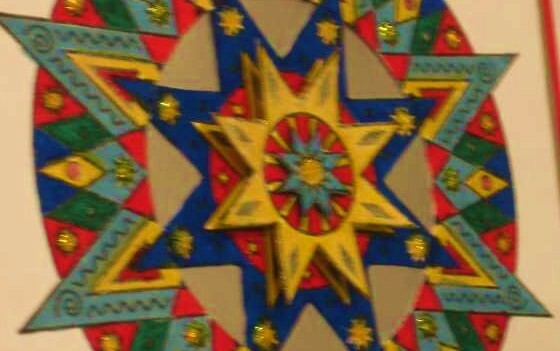 Yellow Stickles was applied to the yellow stars and the star on top. These are not my usual colors, but I like the way it turned out. Don't Forget the BLACK FRIDAY specials at Firecracker Designs by Pamela- I ordered mine this morning! (Merry Christmas to me! )................My husband thinks I NEED a bike..........I would rather have more rubber! Oh- this is also for the Saturday Spotlight with Hidden Potential - focus on ornaments this week. BLOG CANDY- check this post - will be awarded at 8PM Friday! Please leave your e-mail address on the PRIOR post to win. Also, if you were referred by a friend- leave her name too- she will get an 'extra' chance to win! I like to try the sketch challenges when I can- and this weeks Sketch at Splitcoaststampers is a great one- perfect for this sweet little Vintage child on a sled with a puppy. This sentiment and the Sledding child with a puppy are from Firecracker Designs by Pamela. 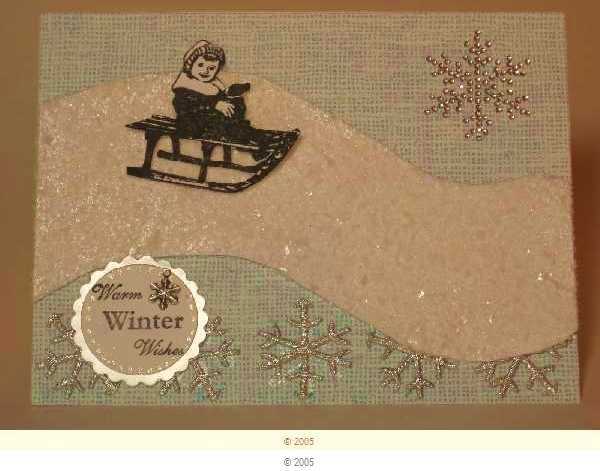 The child on the sled is one of just a few of the clear stamps she offers. I saw a posting for Faux Flower Soft that I thought would be fun to try. Cut a Styrofoam ball in half, and rub the halves together- Faux Flower Soft. You can put reinker in a baggie with it and color it any color you would like- so it will match your project. 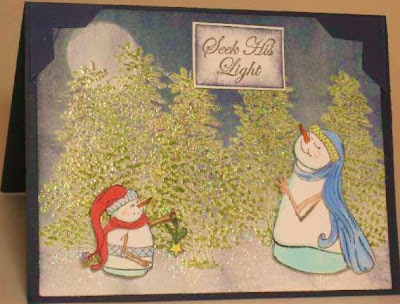 I added Martha Stewart White Glitter named 'snow' in with it, and glued it to the CS. Thanks for stopping by! Remember to click on the above link to enter my blog candy! I am really enjoying crafting with this stamp set- I really love this Snow Shepherd that is looking up to the sky-seeking His Light! I repeatedly masked and stamped the sheep for the BG. I outlined the sheep and highlighted them with Copic marker W1, and the panel sponged with Close to Cocoa. The stamps are from Snow Shepherd from Firecracker Designs by Pamela- the words Do you see what I see were stamped for the panel on the Rt. It is matted on Bordering Blue CS by SU that is sponged with ink and distressed. I stamped the star on the lightpole and cut it out carefully. It is colored (Y13) and covered with stickles. The image is outlined with Bordering Blue and I used the Torn Frame technique from the Technique Junkies. OK- now on to the Blog Candy- I have a set of 6 Cuttlebug Folders from the Home Shopping Network to give away- leave a comment by Friday 11/27 at 8PM. If you tell a friend and they mention your name when they leave a comment, I will put your name in for another chance to win. If you follow the above link, you can see the folders in close up views. Please leave me an e-mail address to contact you- and you will have until Sunday PM at 8PM to send me your snail address. Thanks for stopping by to the Firecracker Designs by Pamela Blog Hop this past weekend- there were 9 chances to win on our hop, so don't forget to check back at the other designers blogs- the links are in my previous post and on my side bar. 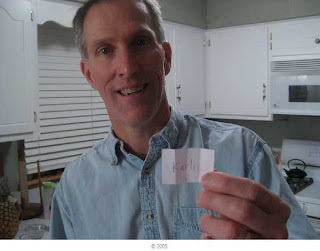 The winner is # 19 and that is Kellie I will send you an e-mail right now! Congrats! Please send me your address and the stamp set Santa Paws will be in the mail to you. Please check for my new posting tonight- I will be offering another blog candy! Firecracker Designs by Pamela Blog Hop PLUS CANDY!!!!! Hello and welcome to the Firecracker Designs by Pamela Blog Hop for November. Our theme this month is Thanks- so I made some 3-D items to give to those that affect my life in a positive way- as a token of my Thanks for their presence in my life! First, a little bit of information about the blog hop. 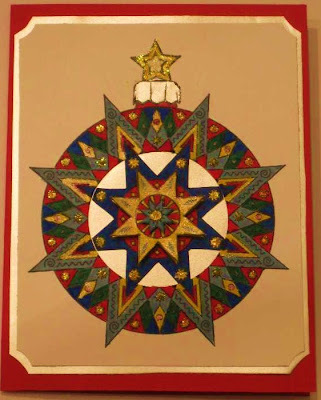 This is a circular Blog hop- when you arrive back where you began the hop-you are all done. Next, CANDY, yes, LOTS of CANDY is available on this Blog Tour- on each blog you visit, leave a comment and you have a chance to win CANDY (each blog will award one stamp set)! And, it's the good kind that does not end up on your hips...... Pamela will also be have CANDY for an overall winner! Thanks for your generosity Pamela! Wahoo! All you have to do to win is to leave a comment. It's that simple! Oh- each Blog candy has a different candy to give as well. Blog Candy will be awarded at 8PM on Monday November 23rd CST on my blog. (Remember we may be in different time zones). Here is the set I am giving away! I have been having fun paper crafting this past week. I originally had a different project in mind, but then came across this awesome Tag Box on a blog- with the dimensions. I just had to give it a try. I really liked it, so it became the new direction for my Blog Hop project. Here it is open- I added the blue scallop out of a coordinating paper, and used Christmas Phrases 1 by FCD for the sentiment . I added some bling on the top of the Tag Box. 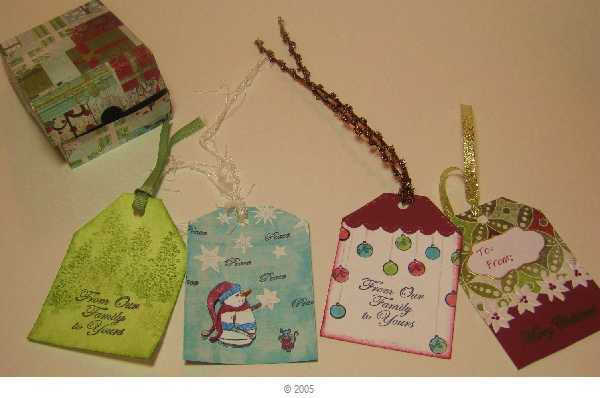 The tags are made with the Matchbox Die from SU and the Tag Punch by SU. The Tags inside are stamped with various FCD sets- on the Lt- gloves from Love Never Melts, the center- Christmas Phrases 1, and on the Rt, snowflakes from Love Never Melts and Let's Celebrate- all from FCD. Next, I decided to make some Tag Boxes. They are made with base card stock cut 2 3/4 wide by 7 inches long. The CS was scored 2 1/2 inches from each edge. I made side pieces that are 2 5/8 and tapered to fit the side- on the top 1 3/8" wide and the bottom 2 inches wide. I used red line tape to attach the side and the tags to the front and back. The tags measure 2 3/4 " wide by 4 5/8" long. You can change any of the measurements to make your tag box it's own size. Box on the Right-Nestability Labels 4 (3rd smallest), Sentiment Christmas Phrases 1 +acetate, scallop edge punch SU for Dp on top and bottom and bling. Next, I decided to take a hinged box and make a gift box. This is so quick and easy. I embossed the snowflakes from Love Never Melts and Let's Celebrate with White EP and sponged on Soft Sky and Blue Bayou onto labels from Avery- the address label size. The labels are wrapped around Hershey nuggets. The sentiment is from Christmas Phrases 1. The CS wrapping the box (retired SU Baroque Burgandy)was cut to fit and punched with the scallop edge punch by SU. The Basic Grey paper, again Figgy Pudding, was added and the sentiment mounted on Soft Sky. White organdy ribbon added around the box like you would wrap ribbon around a gift box- hard to see in the picture. 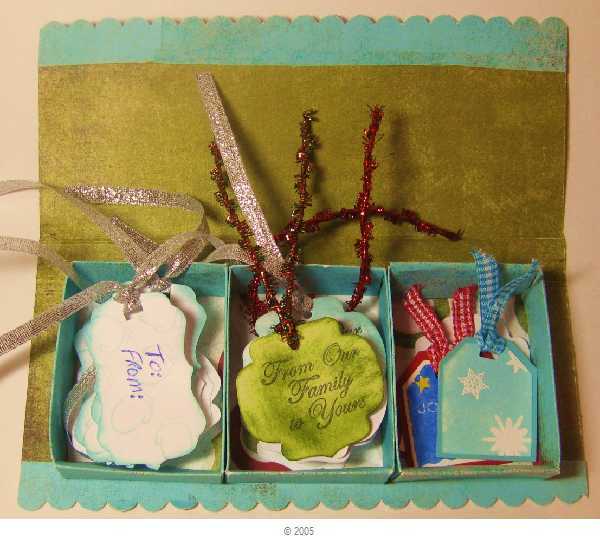 Finally, I finished my stamping fun with tags made that fit into a box made out of a piece of DT. The link for the box that fits ATC sized tags or ATC's was found here. I had to add some techniques from the Technique Junkies Newsletter to my project. The 2nd to the Lt tag (blue) is made with the Faux Sanding Technique. 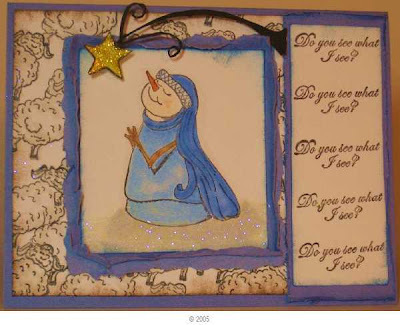 The snowflakes (FCD as above) are embossed with White EP, and the image colored with SU markers and Angel Wings Shimmerz (from FCD). Can you see the little mouse on the tag too? Sentiment and snowman from Snow Shepherd from FCD. Tag #3 The ornaments from Christmas Phrases 1 stamped in Black Memento Tuxedo Ink and colored with Su markers. Each ornament covered with Crystal effects. Tag top punched with the SU scallop edge punch and outlined with Faux Stitching Technique (TJ). The faus stitching and the strings the ornaments are on are done with a Sakura jelly Roll Pen. 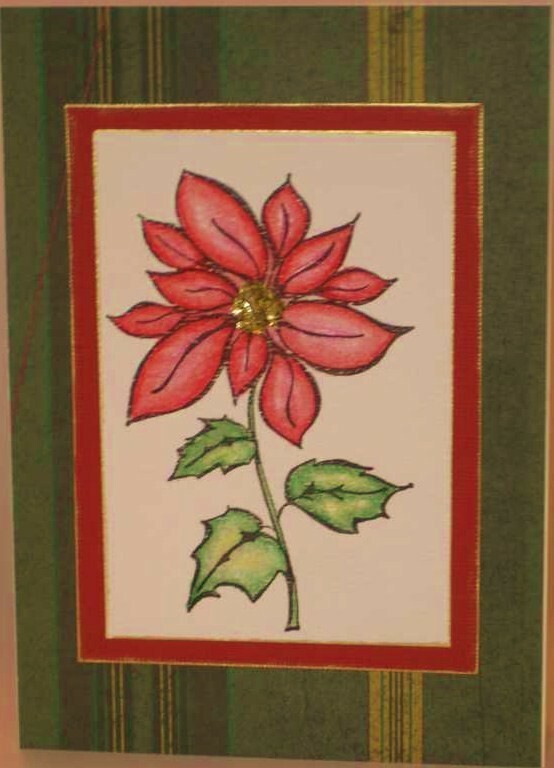 Finally, the last tag is DSP on the top, the SU Poinsettia embossing folder from SU- the flowers were individually cut out and painted with Shimmerz after centers colored with Baroque Burg (SU). 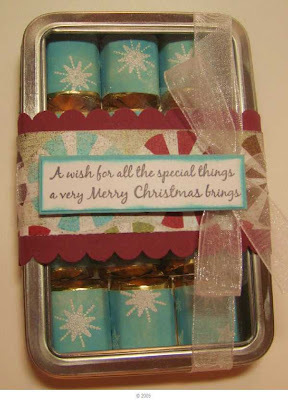 The Tag is outlined with a Gold Leafing pen and the sentiment from Christmas Phrases 1 is embossed with Gold EP. Whew- are you exhausted from reading all of that? Thanks for hanging in there! Please don't forget to leave an e-mail address so I can contact you if you win the Blog candy. Good Luck! And, I will be posting another card at the end of this blog hop (Monday night) with another blog candy- please stop back to check it out! 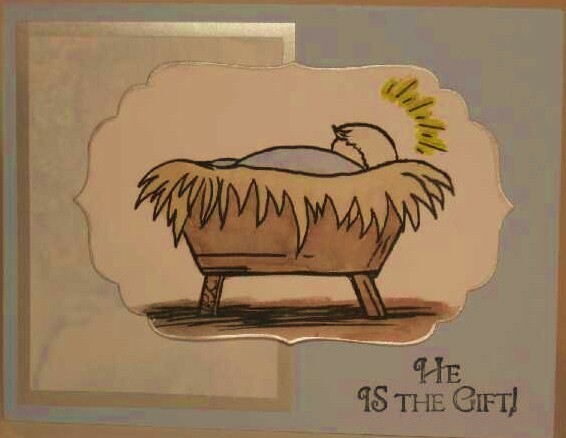 This is a quick and easy card made using Prismacolor and Gamsol I made when I took a basic class-as mentioned in my Give Thanks card last Friday. I do not know who makes this image. The center has gold elements by Barbra Trombley's . I outlined the edge of the card stock with the image and the red behind it with a gold leafing pen. Featured Stamper "Dawn, aka Treasure Oiler"
Each Sunday, there is a challenge on SCS where there is a chosen Stamper- you find a card in their gallery, and change 3 things on the card. This week the Featured Stamper is Dawn . I had some fun today using a digital image that is brand new over at Firecracker Designs by Pamela . For this card, I printed the Digital image from FCD blog posting, and printed it out on Stampin Up Whisper White and Georgia Pacific CS, plus, I printed out a page of images on Vellum (from Marco's Paper). I printed out a couple of different sizes by opening up a Microsoft Word program, and I saved each program so the file is set and ready to go if I want to make more cards with them. This image is watercolored with SU colors and an Aquapainter. The Nestability cut out is the largest size in the Labels Four- so to add dimention, I outlined it with the Silver Leafing Pen. The side panel is reinker smoosh from the Technique Junkies newsletter. Well, I accidentally stamped the sentiment in the wrong spot to start off with.....So, to avoid wasting CS, I flipped the card, and adjusted..... The Technique panel again was stamped repeatedly with Versamark and embossed with Silver EP. I sponged around the edge with Bashful Blue. The main image has been printed on Vellum and is colored in from behind with SU markers. I had a small area that was empty at the bottom, so I added the clear Dew Drops with Crystal Effects. These cards are quick and easy to make- I will be making more of them. This is the same digital image- printed in different sizes and on different papers- including vellum. That is one of the things I enjoy about digital images- they are inexpensive and versatile. This week I took a beginners class with Prismacolor Pencils and Gamsol at The Cottage Stamper in St Charles, Illinois. It is not a huge store, but there is ALOT of great stuff packed into their space. I have had a set of the pencils for 10-12 years, and they have been dusted off finally! 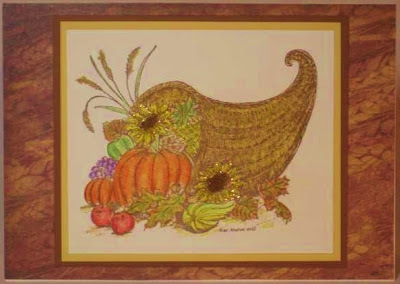 This is my fall card we created in the class with a stamp by Northwoods. A couple of things I love- the leaves of the sunflower are outlined with a glue pen called Quicky Glue by Sakura and glitter sprinkled on. I love this look- and I have a lot of glitter to use. In the centers of the flowers, we applied glue and then used Barbara Trombley's Elements- this is a great earthy look- I love it IRL. There is some applied to the wheat stalks as well. I am starting to work my way through the book Masterful Color Vibrant Colored Pencil Paintings Layer by Layer by Arlene Steinberg. The first exercise I am going to work on is taking Prismacolor Pencils and make my own color wheel. Once I do that, I am going to figure out a chart (like my Copic chart) by color for the Prismacolor pencils- I have not found one yet, so may have to create one. It will help me in the long run to learn which pencils will look good together as well. Thanks for stopping by! I hope you enjoy a wonderful fall day! 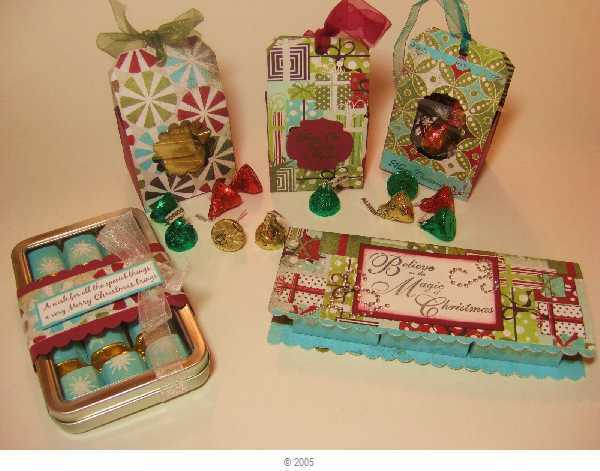 The Featured Stamper at Splitcoaststampers is Christine M., aka Chrisations.ink! My first idea was to make a Christmas Card. I stamped the trees 5 times first in Old Olive then in Versamark, and then in Always Artichoke and Versamark. I clear Embossed the entire group of the trees. Next, for the sky, I brayered on some Bashful Blue- oops- there was some green on the brayer (or in the blue ink- hope not), so the sky looked kinda like a tornado was on its way. Night of Navy to the rescue- I am using Stamping Up ink colors if you are wondering. I brayered lightly the Bashful Blue again to highlight the moon. 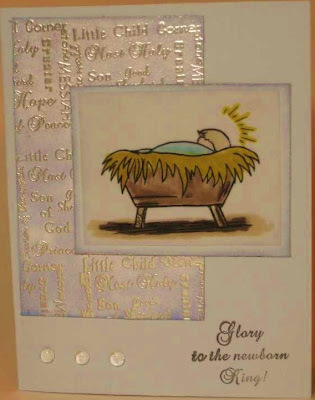 I sponged the navy ink around the edges of the card, and added just a touch below the tree bases for a little highlight. Next, I added Irridescent Ice EP after I colored Versamark on the branches and the card base with the Versamark Pen. I did this twice and I made a mess- lots of glitter all over the kitchen! 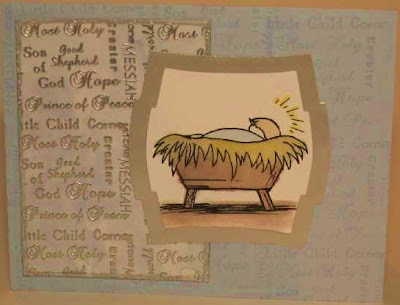 I decided instead of just adding a sentiment, as was my initial thought, to add in the snow Shepherd Mom and Child and use the sentiment Seeking His Light. I like to try to make my Christmas Cards with a Religous tone if at all possible. Don't you love Mom's facial expression? Feeling the warmth of Jesus shining on her face- he's the reason for the season afterall! 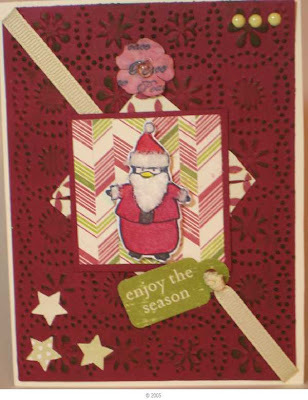 The stamps I used are from Firecracker Designs by Pamela- the Snow Shepherd set and Just Breathe Again for the trees. This also meets the Challenge at Saturday Spotlight with Hidden Potential- use a stamp repeatedly- as in my trees- on your card. Thanks for stopping by! Hope you are having a wonderful Sunday! A Sketch Challenge by a 10 year old- she has her own blog for the challenge- too cute, huh? I found an image of a cute penguin from an image swap I was in last year- so I have no clue where it is from. I colored the image with Prismacolor Pencils and Gamsol. I added flower soft to the white parts of the hat, the beard and the sleeve cuffs. The BG was put through the Cuttlebug and highlighted with Bravo Burgandy. The flower is colored with bravo Burg and the stamp on it is Peace by Firecracker Designs by Pamela- there is a Dew Drop in the center of the flower.. In all of the years that I have been stamping and creating cards, I have never made a reflection card! I greatly admire them, but for some reason, have not given it a try yet. Some of the directions tell you to use a brayer, some waxed paper, some go into great lengths about lining up your image, some use a Mirror Image stamp (I have one- have only tried using it once..) ..... Well, I came across a tutorial for doing the reflection technique that is so easy, I am not sure why I have never given this a try before! The link is HERE. I have never heard of using acetate before for a reflection image- but it is fast and easy- I used Tuxedo Memento ink, and I could see right through the acetate- so the reflection went directly where I wanted it to go! 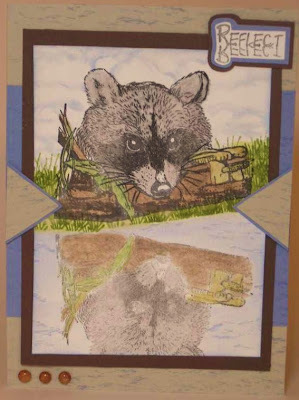 Now, this stamp has a bit of detail in it, and you can see that it transferred beautifully- this stamp is Riley Raccoon from FCD. Raccoon- 1018- wait that is pink! I used the Complimentary color uncoloring technique- it really does look better than the raccoon images I colored without it..... and the GREYS: 1051, 1052, 1054 and 1056 (over the pink color- really!). Grasses: 988, 911 and 908. Mushrooms: 940, 942, 1034 and the log: 945, 946, 947, 948. And, I used Black to highlight Riley's mask and darker highlights around his head and face. I added a touch of color with the Aquapainter -Creamy Carmel and Close to Cocoa at the base of the log, then used the small grass and larger grass stamp from the FCD set called Just Breathe (again) I added grass with Old Olive- I added the first layer, then Aquapainted over it so it looked natural- to get rid of the white spaces, then once that was dry, added another layer of stamped grasses. Ok, next I added a wash with the Aquapainter in Bashful Blue ink to the base of the card. I used a stamp from the Just Breathe stamp set that gives the ripples in the water with Bashful Blue. I added another layer of color wash to deepen the color. For the sky, I punched out a scalloped oval, and used the blue ink with the Aquapainter and colored around the edge of the scallop. I went over the lines with the Aquabrush to soften the lines. Finally, I decided to use the layout from Splitcoaststampers Sketch Challenge 253- I have not been able to do the Sketch Challenge in a while and like the way it looks with this sketch. I stamped the water waves image from Just Breath (again) again.... in blue on the background papers and on the edge triangles. I stamped the REFLECT image from the stamp set Thinking of You . I added Dew Drops in the bottom Lt corner to balance the card. Finally, I added a little bit of white gel pen by Sakura to the ripples in the water- I like the look I achieved. CS used all SU- Sahara Sand, Choc Chip, Brocade Blue and White. I hope you enjoyed my Reflection Technique for the day- and, thanks for stopping by! Click on the link on my sidebar to view the other Bloggers Challenge Technique ideas for today. 3)I used a different ribbon treatment. 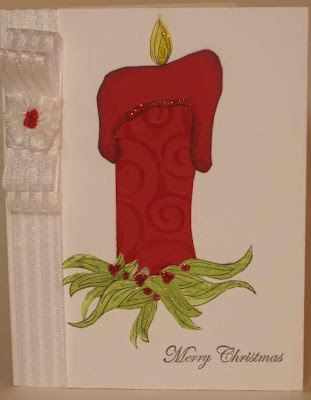 OK, so I have no stamp with a candle- so I improvised. I took plain Real Red CS and put it through the Cuttlebug, then highlighted the embossed areas with Real Red ink straight from the ink spot. Next, I cut out a 'topper' and applied black ink around the edges with a sponge. I added red stickles to the 'topper'. The flame is the inside of the campfire flame in this set (by FCD) Well, all of the Holly leaves are HUGE, so I decided- why waste the rest of a good image- and colored in the campfire with green Prismacolor pencils and blended with Gamsol- which worked OK, so I stamped a few more of the flames, colored them in and cut them apart- these leaves became my leaves at the base of the candle. I added a few red stickles for berries on the leaves, then added yellow stickles to the flame. 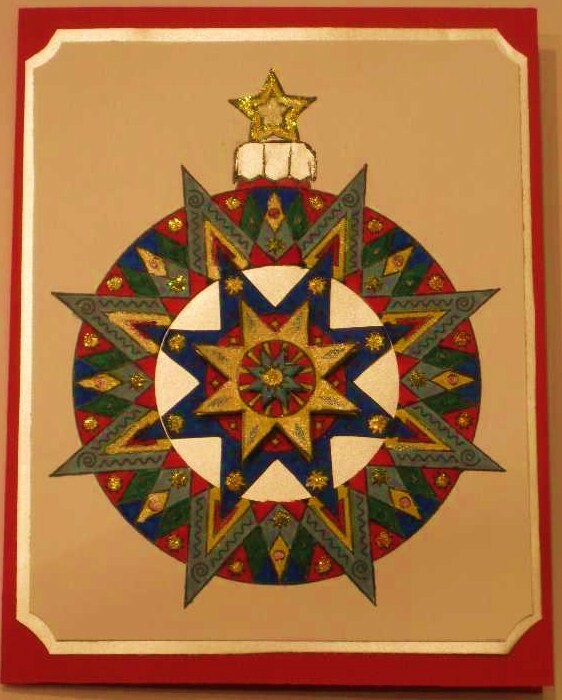 I made two of these cards, and since we are getting closer and closer to Christmas, that was a good thing! A great challenge for a Sunday afternoon. I colored the leaves and the flame with Prismacolor Pencils and gamsol. I found a great thread on SPS talking about the pencils, and stayed up half of the night reading it. I have a set of 120 of these pencils, and would love to use them more- need more color confidence. The combination of greens was a suggestion by Mr Hambo on the thread. I used 1005 Limepeel, Marine Green 988, Kelp Green 1090 and Dark green 908. I added a touch of White to the center of the leaves. The flames on the candle are 917 and 1003. I spend some time making a color chart, and writing down the 8 or 10 newer pencils that I do not have- as they retired a few of the pencils in my set and added a few more colors. Here is that post if you care to check it out. I love to have charts like this- as I use mostly SU papers, and it makes it easier to match up colors. Thanks for stopping by!I sure hope you enjoyed my ramblings today!